This is Steve with another blog post about an important topic of AotSS. This time, we’re going to talk about viceroys, since they play an incredibly important part of the game and in order to be successful, you need to understand how they work. First, what do Viceroys do? Basically, they head your planetary government and are the House who holds that planets’ representative to the Imperial government (you). Viceroys have a thankless job, really. They are accountable to 3 levels: their House, you, and their Pops who are living on the planet. Any one of those entities could cause issues for the viceroy, but it is essential that a good Viceroy understand how their Pops feel about them. They must also try to set forth the goals that their House Leader has set for their House, whether it’s raising cash, creating more infrastructure, building up the planet, or generating more materials for the House to use; this may or may not be at odds with what you want that planet to be doing and how the Pops feel about it! So what’s the situation? This is a small system capital, with no other planets in the system worth a damn, so it is unlikely there will be any neighbors soon. The planet has just under 100M people, but even though it has a system trade hub, there are not enough merchants to generate even one trade fleet! In addition, the planet is hemorrhaging money, and is a serious drain on the Empire (it’s a holding). Let’s take a closer look, shall we? Here’s a close look at the good viceroy’s character screen. For our purposes, we’ll consider his admin skill, his traits, and his personality matrix to try to understand what he might do. He has an admin skill of 1 (not to be confused with the government skill which can go from 0 to 200; we’ll look at that in a minute) which isn’t great for someone who is running a system capital, no matter how crappy. On the positive side, he has high Honor and Empathy, which mean that he will tend to take care of the Pops under his rule (hence the high Food build). He has a low Charm trait, meaning that he’s basically not a great politician, but fortunately he’s a decent guy so his people are generally OK with him (40% Love, no Fear). The important stat for a Viceroy is their Intelligence, basically how smart they are and what they consider when faced with multiple priorities. Rosko is pretty stupid, meaning that he will often make a poor choice when faced with a task; i.e. recruit certain Pops to the planet, create an intelligent build plan, or run the economy and make good trades that make sense for the planet. It also explains why he’s running his manufacturing sector flat out when there’s not really a critical need (and he’s in the negative with net production of all materials!) 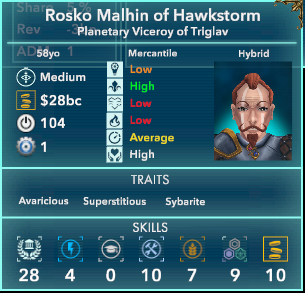 So ol’ Rosko will probably need to be micromanaged to some extent to make him useful, but that’s probably not the best way to spend your APs with a sprawling empire to run. On the down side, he’s avaricious (basically a highly material person) which explains why he has managed to accrue a $28 billion personal account even though he’s on a backwater world, a sybarite (meaning he’s highly likely to take bribes) and superstitious (meaning that he is very likely to change his planetary strategy after an event of some kind). This last won’t matter as game events aren’t in (yet!) but the first two certainly will. He already has a friendly relationship with me as the emperor, and characters who run Holdings that are of your House are already highly disposed to do what you ask them, unless it really goes against their personality or they really, really, REALLY hate you. So I probably won’t need to bribe him, even though it would most likely work. Well, the low Intelligence is borne out by his skill values. Remember that they go from 0-200, where 50 is average, 100 is skilled, and 150+ is exceptional/genius level in a skill. From left to right, his Government Skill is 28 (used mainly for determining ADM that can be pulled out of a planet’s administration infrastructure), his High Tech skill is 4 (used for adjusting the High Tech/energy production on a world/system), his Academic skill is 0 (determines how effective Academies are on a planet, how many Pops they can take, and how likely Academics are to want to migrate there), his Engineering skill is 10 (determines how effectively the planet can generate Build Points and attract Engineers), his Farming skill is 7 (determines how effectively the planet can generate food and attract Farmers), his Mining skill is 9 (determines how effectively the planet can mine materials from the surface, how quickly the planet exhausts its reserves, and attract Miners) and the Economic skill of this savant is 10 (determines how much GPP the planet generates, how effective trades are with other hubs, how effective the retail sector is, and how much Merchants are willing to relocate there). Well, that’s not exactly Gaia, now is it? 8 regions are desert, 2 mountainous, and the rest are so inhospitable that they are uninhabitable. The bio level is 43/100 which is on the very low end of what you would want a planet to support a large population with. Food will be difficult to grow. Energy reserves are pretty good (65) which is what you would expect from a desert world, and heavy materials are pretty abundant (68) but basic and rare materials are in very short supply. In short, this is a crappy world, and getting the most out of it will take a lot of work. And it is clear that this viceroy does not have many of the answers. Replace the viceroy with someone else who is currently not in a post in your House. Brutally effective, but it will create Fear in your Empire, and specifically in that planet/system. Or find your own way to deal with it! Experiment! Hopefully you can see a taste of what a Viceroy means to a planet, some of the decisions they make, and the options you have to deal with a low-performing Viceroy. This is some of the high-level strategic gameplay that AotSS is aiming to develop and create. Previous post: Now that .7 is out… what’s next? A sneak peak of .7’s evolution!! Is this a mentally handicapped viceroy? .7.2.1 update – changelog notes here! By Request – All .7 Changelogs Posted Here Going Forward! Threats, Favors, and Requests… The Comm System At Work! It’s Time To Plot… But Not what you Think! 163,932 visitors have come to learn more about Imperia. Thanks for being one of 'em!